After eating a Butterfinger for breakfast one morning, I realized my life needed more discipline and I wrote this. Inspired by my sister, sister-in-law, and others I started a blog and decided to set a few challenging goals for myself like running a half marathon and reading the Bible cover to cover in one year. I did meet my goal of running a half marathon, but only made it to the book of Judges in my Bible that year. 😦 But I still read my Bible, so that’s good, right? With two toddlers running around, somedays I am lucky I get to brush my teeth, let alone read my Bible and exercise. And yet, these things are important to keep us mentally fit. Thus is the conundrum of motherhood. It isn’t for the weak or weary. So join me while I stumble through life, leaning on THE everlasting arms of Christ. This is my journey towards becoming more like the woman I want to be and accepting myself for who I am, Butterfingers, chocolate cake and all, just like He accepts me. 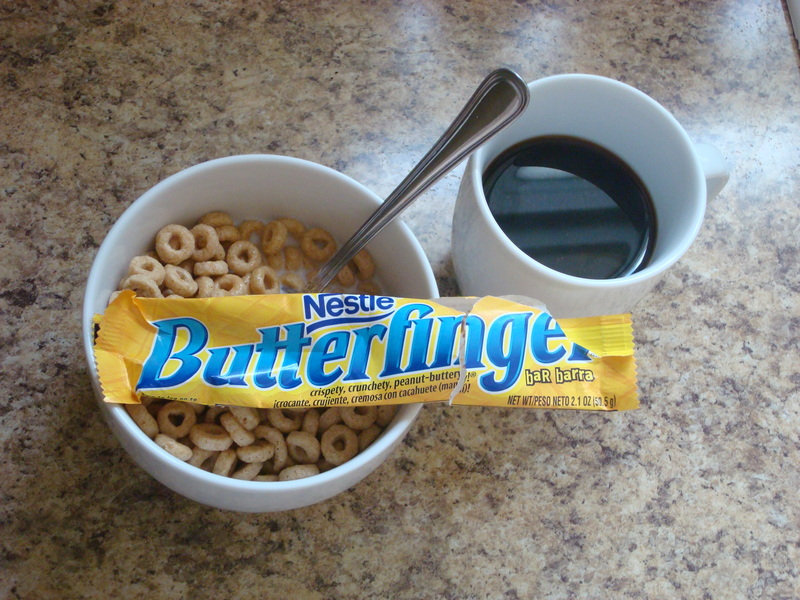 The combination of Butterfingers, Cheerios and coffee looks delicious!! You know, they say you should consume the most calories in the morning because you have all day to burn them off. So what’s really the harm in a butterfinger for breakfast? I like your way of thinking, Leah. Thanks for stopping by! Oops, still don’t know what a butterfinger is! I came back from the States (I’m an expat in Tuscany) and brought all my co-workers Halloween candy. I have distributed it all except for a lone Butterfinger, which is courageously sitting in my kitchen waiting for the 31 of Oct…..will it make it?